How do PERCENT AVERAGE spending calculations work in Fundriver? How does unitization work in Fundriver? Several years ago, Fundriver changed the content and layout of the Manager Module. To date, many clients have not transitioned over to the new format and are still working within the old framework. For the most part, the changes that were made removed little used fields and added fields that clients were requesting. 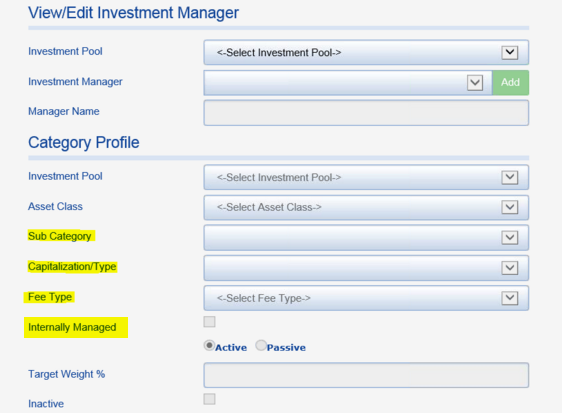 There should be very little impact to clients that choose to update to the new Manager Module. The purpose of this article is to show the differences between the two modules so that client's can make an educated decision about whether they would like to upgrade to the new format. The current Manager Module screen is shown below. Fields highlighted in yellow indicate fields that were added since the previous version. In the new version, drop down entries are added simply by clicking on the green ADD buttons. No separate table management screen is used. With the old Manager Module, drop downs had to be populated through the MANAGER CATEGORIES tab. 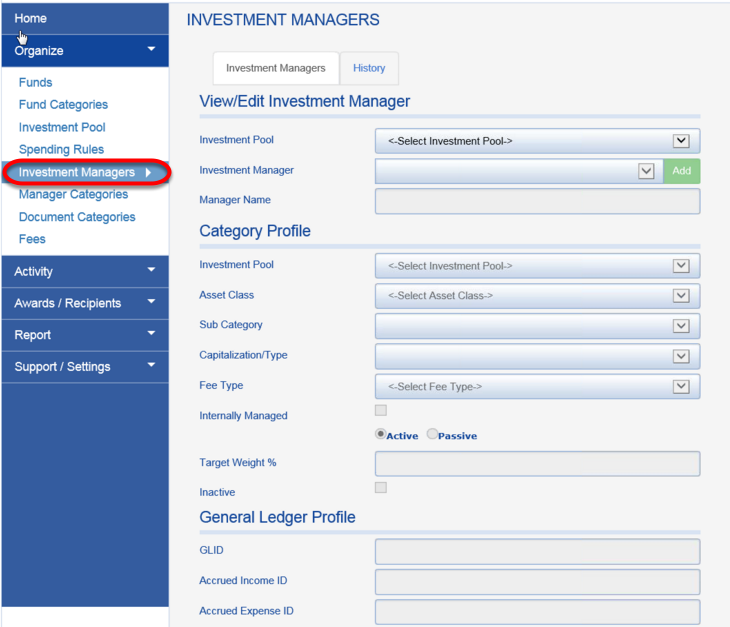 The old Manager Module is accessed through the INVESTMENT MANAGERS tab. 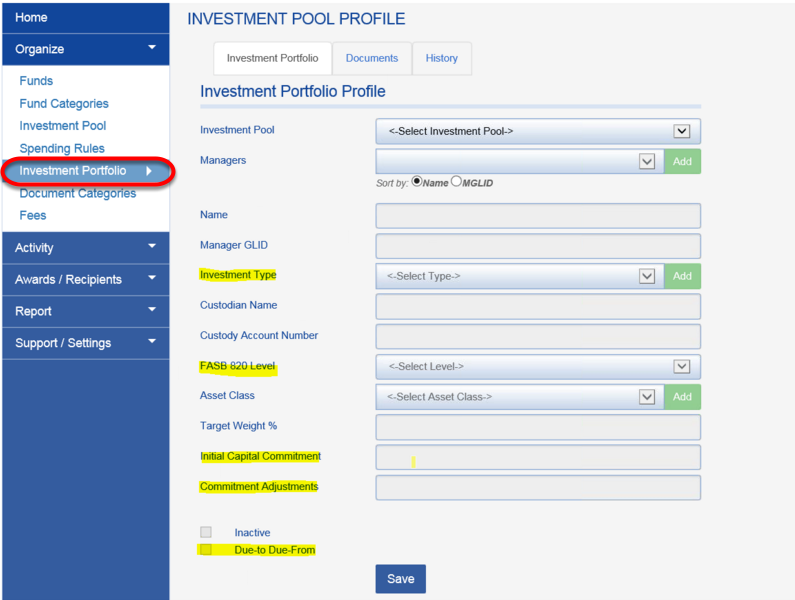 The highlights shown below indicate fields which are no longer available in the updated version. The GLID shown below corresponds with the Manager GLID in the new version. Accrued Income/Expense ID are not available in the new module. The Accrued Income/Expense ID fields were rarely used by clients, which is why they did not migrate to the new version. Please speak with a Fundriver Support person if you are unsure how upgrading to the New Manager Module may affect your Manager data entry.